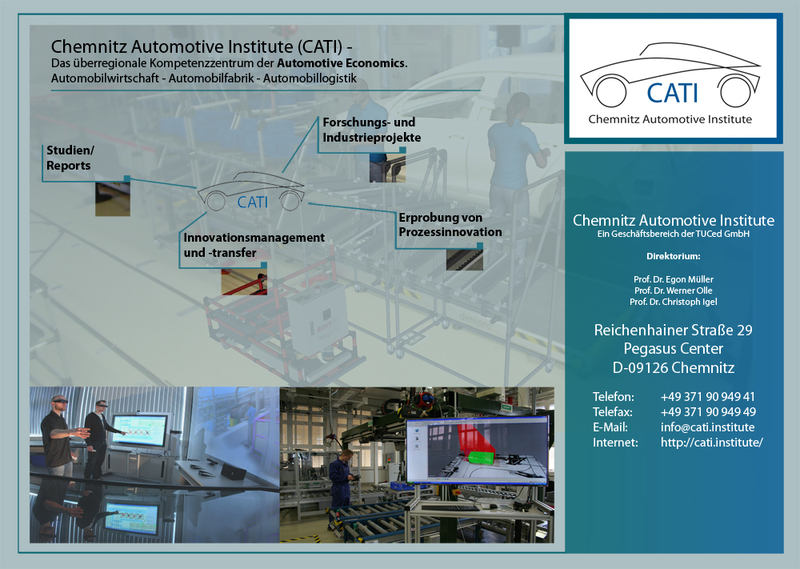 CATI is the acronym for the newly founded Chemnitz Automotive Institute, which began operations in early 2015 within TU Chemnitz. Despite its Saxony roots, CATI is aiming to establish a profile as a national competence centre for automotive economics. In addition to Saxony considerations, there has always been a sporting force behind this project, according to one of CATI’s founding fathers Prof. Werner Olle: Germany’s research and institutional landscape has three leading institutes, located in Duisburg, Bergisch-Gladbach and Nürtingen, none of which are exactly automotive strongholds. The ‘car state’ of Saxony has thus far remained unrepresented, something which should change with this new Saxony automotive competence centre. The Chemnitz Automotive Institute, headed by professors Dr. Egon Müller, Dr. Werner Olle and Dr. Christoph Igel, is offering a profile and range of services which sets it far apart from existing institutions. CATI is geared towards the automotive industry’s design needs arising from the three major challenges of internalisation, innovation and demographic change. Building on this strategic orientation, CATI initiates, conducts and pools research and innovation activities in the fields of automotive economy, automotive factories and automotive logistics, focusing in particular on developing, testing and transferring process innovations. The considerable importance of innovation, technology and knowledge transfer meant that the institute was initially deliberately incorporated as an independent business unit into an existing institution within TU Chemnitz, namely TU Chemnitz education (TUCed GmbH). ‘This institutionally embedded link was welcomed by all practice partners, who are already facing immense challenges in recruiting, qualifying and further training their staff. This will be further enhanced within the context of the future trend of industry 4.0’, according to Prof. Christoph Igel, a member of CATI’s Board of Directors and CEO of TUCed GmbH. Since TUCed is also an inter-institutional and cross-thematic platform for knowledge and technology transfer at TU Chemnitz, this constellation also enables close interconnections with other faculties, institutes and professors such as the Institute for Management and Factory Systems (IBF) with its innovation laboratory, due to be further developed into an industry 4.0 application centre. ‘CATI is an excellent addition and expansion for our current activities, as it opens up whole series of new topics and links which are urgently required for the issue of industry 4.0’, according to Prof. Egon Müller, Director of IBF and a member of CATI’s Board of Directors. ‘Science-to-business’, the postulate of applied research envisaged by CATI, is by no means a one-way street: it requires ongoing consulting and support from competent industry partners. This task is entrusted to the Advisory Board of the Chemnitz Automotive Institute, established in early December 2014, with capable members including famous names from the automotive industry. At its inaugural meeting, the Advisory Board adopted a programme of selected initial projects presented by the Board of Directors, over the subsequent few months initially focusing on the digitisation of production (in particular for medium-sized companies), the employment impact of the internationalisation of the German automotive industry, automation in logistics, and future structures of automotive value creation. The members of the Advisory Board also proposed tackling the medium-term topics of energy efficiency, ergonomics and reindustrialisation. In addition, CATI will be particularly focusing on the topic of employee qualification, for example in the context of industry 4.0 and digital literacy. ‘Despite every occasion to comment ad hoc on all possible automotive industry topics, we will resist the temptation for a constant media presence and will publicise topics which match our profile and our high standards of quality. We owe this at the very least to our practice partners’, Prof. Olle confirmed.